This class is for those of you who know little to no Spanish and are interested in acquiring some practical communication skills. You will be introduced to basic greetings and practice useful questions and answers. 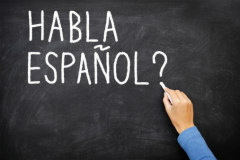 You will learn the fundamentals of Spanish pronunciation while mastering introductory grammar and vocabulary. Basic geography, culture and food. Please read: No Class on Apr 22. Bellevue Library Branch is NOT wheelchair accessible. Text costs approximately $20. Students must purchase on their own. ISBN-13: 978-0764141294 TITLE: Barron's E-Z Spanish AUTHORS: Ruth J. Silverstein and Allen Pomerantz, PhD.